Back in 2006, the International Union of Bakers declared October 16th as World Bread Day, and Zorra of Kochtopf initiated a bread-baking blogger event in honor of the occasion. Having participated in Sugar High Friday 38 that she also hosted last Christmas, I received an invitation to participate in this year's event. About fifteen years ago I decided it was time to overcome my fear of yeast and bake a loaf of bread. I cleared a day on my calendar. I don't know why I was so nervous. Maybe it was because I knew that yeast is a living thing, and if you kill it too soon your bread will not rise and you will have wasted a hell of a lot of flour. Of the two recipes I had access to at the time, the one in my old standby The Good Housekeeping Illustrated Cookbook looked the least intimidating. I wanted to make a good, solid whole wheat bread. I had visions of baking all my bread from then on, if it worked out. 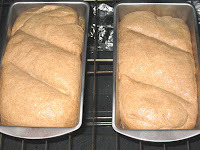 Following the recipe I proofed the yeast, added the molasses and more water and mixed in the oil, salt and flour, let it rise, punched it down, let it rise again, punched it down again, formed it into two loaves, and let it rise yet again before I put it in the oven. And an hour or so later I had two real live (well, actually dead since the heat from the oven killed the yeast) loaves of molasses whole wheat bread. But there were problems. The first one was the molasses. There are certain things that have molasses that I like, but I discovered that whole wheat bread isn't really one of them. 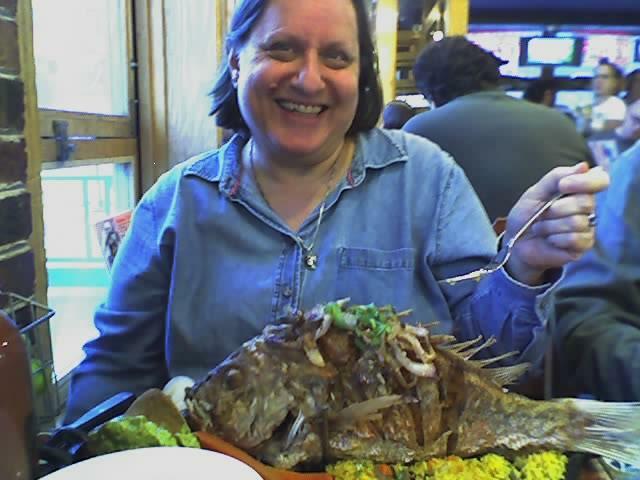 It had too distinctive a taste that overshadowed anything else I tried to put on it. The other problem was that the recipe instructed me to use a hand beater to beat the flour into the liquid. 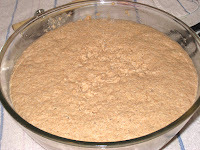 The elasticity of the yeast caused the mixture to grab onto the beater and climb up the stem towards the mixer itself. It made a mess and took me forever because I had to keep stopping to scrape the glop off of the beaters before it infiltrated through the housing. I was proud of my efforts, and encouraged enough to try the recipe in the same book for French bread. It was simpler and involved no beating. It was delicious, but not the bread I wanted to be making. I had overcome my fear of yeast though. Flush with my success, I took a stab at dinner rolls, and while they were unevenly shaped, they looked and tasted like dinner rolls. I even ventured into the world of noodles, with less success (they tasted ok, but it was impossible to cut them evenly.) But I was pretty sure I would never be making another loaf of regular bread again. A short time later I was shelving books at the bookstore where I worked and I ran into The Tassajara Bread Book, by Edward Espe Brown, past president of the San Francisco Zen Center. The book was published by Shambala Publications, which specializes in books on Buddhism and "classics of the wisdom traditions." Intrigued, I bought it, took it home with me, and started reading. And was immediately struck with how simple the author made breadmaking seem. Take flour, water and salt, mix it together and put it in the oven, and you have bread. Add yeast for lightness, honey to sweeten it, oil for moistness and you have the staff of life. The first thing in the book that made me decide it might be worth trying again was how easy Brown made it seem. I don't know that the phrase is anywhere in there, but the message I got as I read through the first sections was "don't fear the bread." 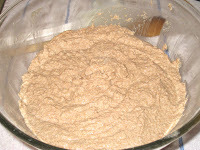 The second was that Brown uses a sponge method; rather than proofing, you mix the yeast, water and half the flour together, let it rise, and then add the salt, oil and the rest of the flour. Third, and the thing that clinched it for me, was the simplicity of the equipment: a bowl, a spoon, and a scraper. No mixers, no proofing, what could be easier? But what really inspired me was that before the recipes themselves, the book contained a series of detailed instructions, loaded with illustrations, that guided the reader through the complete process. The illustrations are simple line drawings, and the text is informal, both of which gave me the feeling that Brown was in the kitchen with me, talking me through the whole process. I rolled up my sleeves and tried again. With great success. 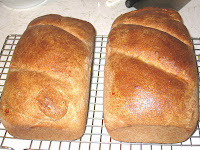 Two beautiful loaves of honey-wheat goodness, delicious with both butter and peanut butter. My co-workers were impressed with the loaf I brought in and it disappeared pretty quickly. I swore I would never buy another loaf of bread again. And never baked another loaf after that. What happened? I got busy. A new position at the bookstore that had me working at least seventy hours a week. A temperamental oven with an unpredictable thermostat. Not only was I not baking bread, I wasn't really cooking anything. I picked up lunch from the restaurants around the bookstore; dinners were cereal and milk or delivery. Not my healthiest years. After I started this knitting blog (heh heh) and watched it morph into a cooking blog, I started thinking about bread again. It had been so long, though, that my old fear of yeast had somehow crept back into my head, so I was content to leave it with the idea that someday, maybe, I would try again. And then Zorra's email popped into my inbox. 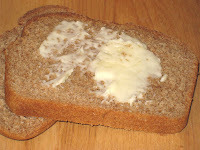 What better way to celebrate World Bread Day than by taking out that bowl, wooden spoon, and scraper and picking up where I left off all those years ago? I had all the ingredients on hand except for the yeast, which was easy for me to pick up on my way home from work. So the Saturday before last I cleared my calendar and decided to spend the day baking bread. I pulled out the Tassajara Bread Book, re-read the instructions a couple of times, and got started. I am not going to post the recipe here. The detailed instructions are the most important part of this recipe. If you have been thinking about baking bread but are at all intimidated, I cannot recommend this book highly enough. 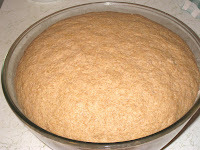 First, I created the sponge by dissolving the yeast into lukewarm water, then gradually adding the whole wheat flour and then beating it with a wooden spoon a hundred times. Doesn't that just scream zen? I covered it with a damp towel and left it in the oven, warmed only by the pilot light, to rise for 50 minutes. It rose quite a bit, as you can see. I added salt and oil and gently folded it into the sponge. I added the rest of the flour, a half a cup at a time, folding it in until the dough pulled away from the bowl and formed a ball. Then I rolled it out onto the countertop, which I had dusted with flour. I sprinkled flour on top of the loaf and kneaded it for about fifteen minutes, gradually adding about another cup of flour before I could knead it without the flour sticking to the counter or to my hands. When it was nice and shiny I put it back into the (now oiled) bowl, covered it, and stuck it back into the unlit oven to rise for another 50 minutes. And you can see that once again it rose quite a bit. I punched it down and took it out of the bowl. At this point, it should have been allowed to rise again, but according to the book this step can be omitted if you are short on time, but the bread will be a little more dense. I like dense, so I omitted this step even though time was not an issue. I pre-heated the oven to 350 degrees. Then I smoothed the dough into a ball and cut it in half, formed each half into a ball, and let them sit for five minutes. 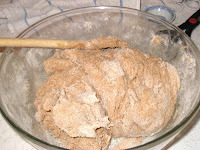 I took each ball and kneaded it about five times, then rolled it into a loaf and put it in a pre-greased loaf pan. I covered both pans and let them rise again for another 20 minutes. Just before putting them into the oven I cut slits in the tops and then brushed the tops with an egg-wash. I put them in the oven and set the timer for 50 minutes. While they were baking, the most wonderful smell started wafting through my apartment. If you've passed by a bread factory then you know what I'm talking about, but it's far more intense when it's coming out of your own oven. I'm sure my neighbors were jealous. I could hardly wait for them to be done. And when they were finally done, I had to wait another hour for them to cool down. What sweet, sweet torture! When they were finally cool, I cut a couple of slices and slathered them with butter. Ok, I didn't really slather, but I wanted to. It's not the healthiest thing in the world, but it's a moral imperative for my first home-made loaf of bread in fifteen years. And now I am wondering why I did not keep up with it back then. It is surprisingly easy to do, and most of the time involved is doing whatever you want around the house while waiting for the different rising periods. The actual hands-on time is short. It was such a success that I made more this weekend. It was even less of a hassle since I was that much more familiar with the process. I have been eating peanut butter sandwiches for breakfast at work lately; it's quick and easy and travels well. 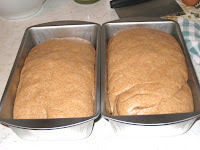 They were especially good this week on my homemade bread, especially since I am having trouble finding a decent whole wheat bread that doesn't have a lot of questionable items on the ingredient list. 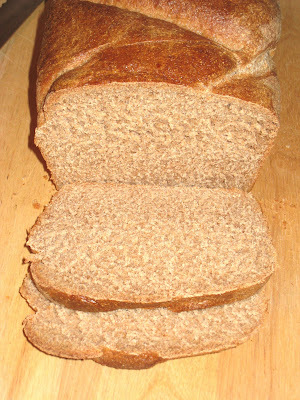 Ingredients for this bread: Water, yeast, honey, flour, oil, salt, and egg. So thank you Zorra, for hosting this event and inspiring me to jump back into the art of baking bread. I will not let another fifteen years go by before I bake more. Wonderful post, and I'm soooo happy you jumped back. The result speaks for itselfs, well done! Thanks, Zorra. I am so glad I jumped back in too. I've made bread for the past three weekends and I don't plan to stop any time soon.